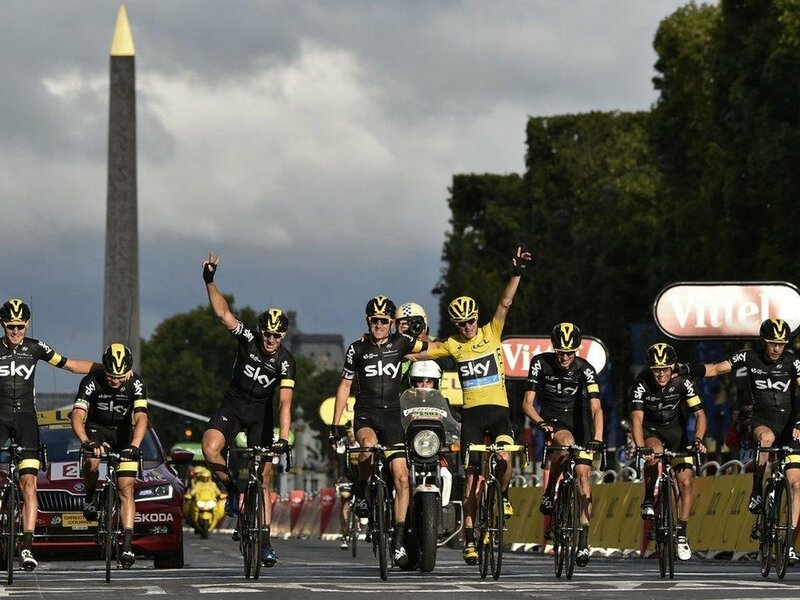 When Team Sky's Chris Froome crossed the finish line on the Champs-Èlysèes on Sunday, cementing a 72-second lead over his nearest competitor Nairo Quintana, he became the first Briton in history to win the Tour de France twice. Team Sky, sponsored by 21st Century Fox, collected the overall team award, marking the third time the team has won the Tour in the past four years. Froome was quick to attribute his success to his fellow riders. "Without you guys, I would not be standing up here," he said to his teammates from the winners' podium. "My utmost respect and gratitude: this is your yellow jersey as much as it is mine." Team Principal Sir Dave Brailsford, echoed Froome's sentiments in a subsequent interview: "Chris couldn't win the biggest bike race in the world without a fantastic team behind him. When you've got a group of world-class guys who are willing to sacrifice everything they've got, every single day to help Chris win. And that's what they did, they pulled together and it was an amazing thing to watch." This emphasis on teamwork and inclusivity has long been a characteristic of both Team Sky's athletic training and its outreach efforts. Its popular SkyRide events, for example, have become a primary means for the team to inspire its fans to live healthier, more active lifestyles. SkyRide began in 2009 as an event to encourage fans to introduce regular exercise to their daily routines. The first event offered fans the chance to participate in a special traffic-free bike ride on a 15-kilometer route through London, and more than 65,000 people attended. The events have only grown in popularity since, and they now include dozens of partner rides in cities throughout the UK every year. Team Sky estimates that programs like these have inspired more than 1 million people in the UK to take up regular cycling. Earlier this year, when the team competed in the Amgen Tour of California, they continued in this spirit of "Inspiration to Participation" by hosting the Soul Cycle | Team Sky Pro Challenge, a high-energy spin class at SoulCycle Beverly Hills to raise money for the Boys & Girls Clubs of America. In addition, 21st Century Fox donated bikes, equipment, and Team Sky gear to local chapters of the Boys & Girls Clubs in the Los Angeles area, helping introduce new youth communities to active, healthy lifestyles.